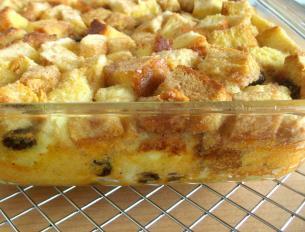 Bread Pudding is home cooking at its best! 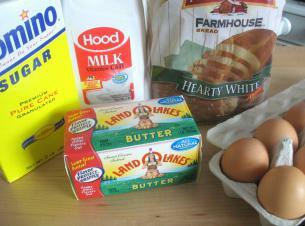 Chances are, you already have on hand almost all the ingredients you will need to make bread pudding: sugar, milk, bread, butter, and eggs. Add four more ingredients – cinnamon, nutmeg, vanilla, and raisins – and you’ve got the fixings for a wonderful dessert that everyone is going to love! 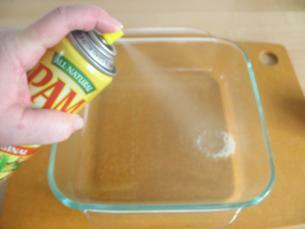 Spray a 1-and-1/2-quart baking (or casserole) dish with non-stick cooking spray. I’m using an 8x8x2 inch square baking dish. 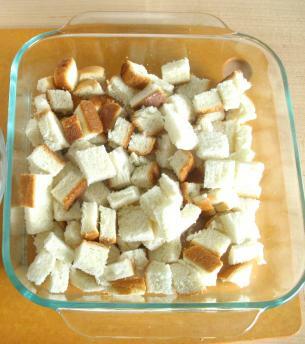 With a knife, cut four ounces of the bread into cubes and put the cubed bread into the prepared dish. 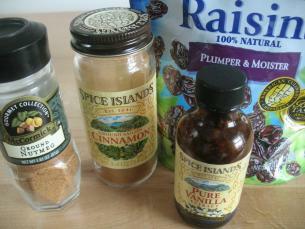 Sprinkle on 1/3 cup of raisins. Set this dish aside for the moment. 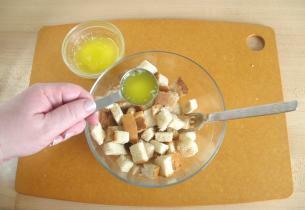 Pour the egg custard over the cubed bread. 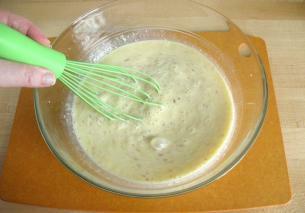 With the back of a spoon, gently press the bread into the egg custard. 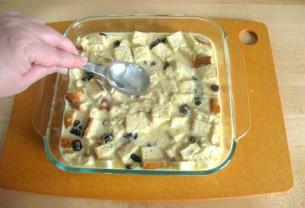 Let the bread pudding rest at room temperature on the counter-top, for 30 minutes. It will look like the picture below after 30 minutes. 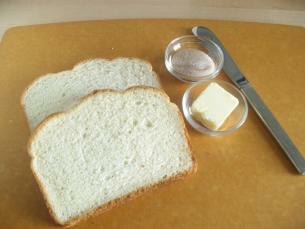 There are two ways to prepare the bread topping. One way is with cubed bread…..
…and the other way is with slices of bread. I will demonstrate both ways, but I personally prefer the topping made with the slices of bread. They both taste the same but I like the crispier texture of the sliced topping. Try both approaches, and then you can decide which you prefer! 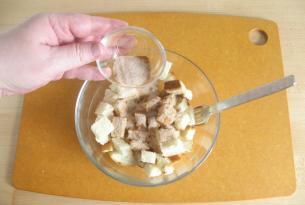 For the sliced topping, combine (in a small bowl) 1 Tablespoon of sugar with 1 teaspoon of cinnamon. 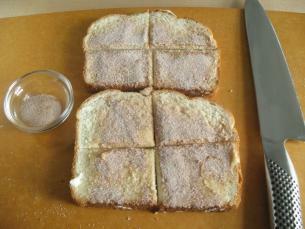 Spread soft butter on the bread and sprinkle on the cinnamon sugar. 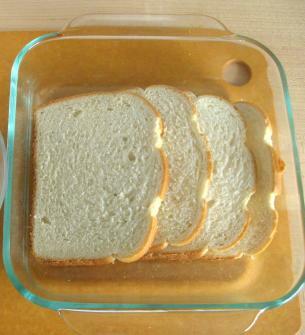 Cut the bread into four pieces and…. …place it on top of the pudding. As it cooks, it develops a nice crispy, toasted top. …and 1 Tablespoon of the butter, which needs to get melted first! Toss these ingredients together with a fork. 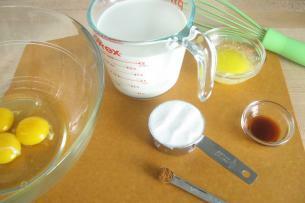 Add the cubes to the pudding. As it bakes, the topping develops a lovely golden color. 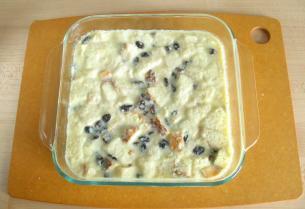 Bake the Bread Pudding in a preheated 325º F degree oven for 50-to-55 minutes. The custard should be puffed and jiggle when you wiggle the dish. Let the pudding sit for 20 minutes before serving it. It will not be quite as puffed as when you took it out of the oven, but it won’t burn your mouth either! 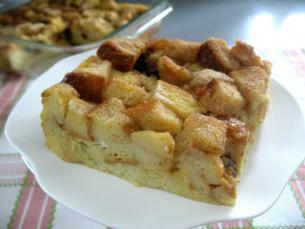 Bread pudding should be eaten while still warm. If there are any leftovers, store it in the refrigerator. By the next day the, it will have deflated quite a bit and have developed a much heavier texture – quite different from when you first baked it. Bread Pudding is perfect plain, but you can add all sorts of toppings – including whipped cream, butterscotch, caramel, chocolate, or bourbon sauce. 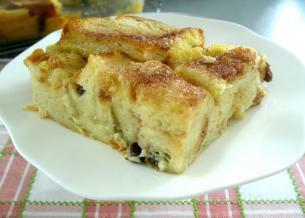 Just so you are aware, in the UK bread and butter pudding and bread pudding are different dishes. 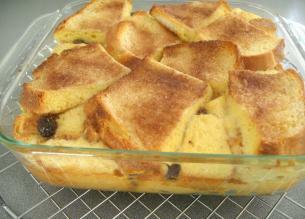 I’ve always loved bread pudding and adore it with a rum sauce or a caramel sauce. I don’t know why but I thought it was going to be much fussier – now I definitely need to try this. Jon – Oh No! Not again! Gizmar – Mmmmm, now we just need a sauce recipe! I know, I know – how confusing is it! 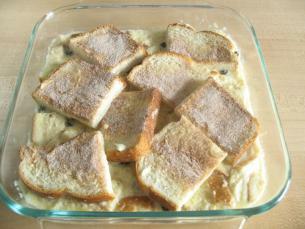 Ona a different tangent I used to have a recipe for a savoury bread & butter pudding – which ws wonderful. I have sadly lost it, so if anybody can help – please le me know. I’ve never actually tried bread pudding before, but looking at this I’m very tempted to get a baking oven just to make this. I don’t think a microwave would do. Thanks for the recipe and instructions btw, gonna print it out for later! This is making me so hungry! Does this have to be white bread? I always have wheat bread on hand. Using what ever bread you have on hand makes your B&B pudding have your own special signature. There are recipes that use challah sweet bread, or French bread, or croissants, or raisin or whole wheat bread. I would of course avoid savory breads like rye bread or focaccia with this recipe! 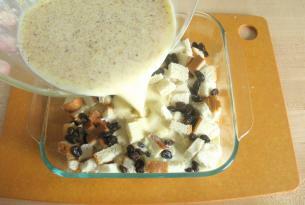 Ice cream and honey sounds like a wonderful topping for bread pudding! Yum post! 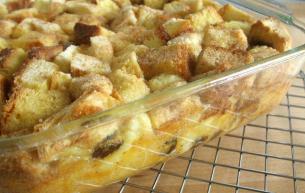 Didn’t realize making bread pudding could be so easy. This would be perfect with a caramel sauce. I love mine with pure Vermont maple syrup and chopped walnuts atop it! It cannot be beat! Very yummy! We did a slightly different twist. Instead of adding raisins, we substituted those with fresh or frozen fruit such as raspberries, peaches and blackberries. Great for a family breakfast! J&K you are totally brilliant! I love your fruit additions! Im going to make use this recipe this weeekend! 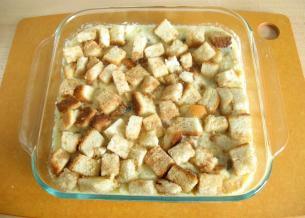 I’m so excited, i’ve been looking for the perfect bread pudding recipe for -ages- and I think this is it!!!!! Hi Senny, I hope you enjoy this recipe as much as the Brownies! I loved Kathy’s tutorial & receipt…and then I discovered Bread Pudding with Brandy that was served at a restaurant. I found out this was created from Silver Palate Cookbook so I am going to create my hybrid “Kathy’s Bread Pudding with Brandy”. I may have discovered the Desert for Royalty! That sounds really delicious! 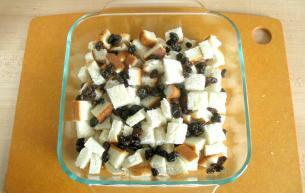 The next time I make bread pudding I’ll have to give it the Royal touch!